ALEX GRANT, after writing a bi-weekly column for the Longmeadow News on town issues since 2007, announces that he is running for one of the two open seats on the Longmeadow Select Board. The election is June 11. The announcement comes a few days after the annual Longmeadow Town Meeting, in which the Select Board’s proposed annual budget was defeated. GRANT spoke at Town Meeting in favor of a compromise budget that restored some of the cuts to the School Department. The cuts advanced by the Select Board would have decimated the renowned Longmeadow music department, led to layoffs of teachers, and increased class sizes. GRANT stated at Town Meeting, “I wish we could send the Select Board back to the drawing board” on the budget. He noted that the Select Board budget’s across-the-board cuts in services also hurt seniors in town. GRANT criticized the Select Board’s policy of taking money from needed town services to put the funds into capital spending at a time when there is no capital plan. Despite the claims of the Select Board and the Town Manager to the contrary, GRANT quoted the interim town manager at the March 6, 2013 budget forum as saying, “There is no capital plan, there should be, there needs to be, it would be better if the capital recommendations for FY 14 were in the context of a capital plan.” GRANT asked that anyone doubting his recitation of the facts to view the DVD recording of the budget forum, read the news story in The Reminder, or to go to his website www.AlexGrantLongmeadow.org to see for themselves the statements from the budget forum. The compromise budget supported by GRANT, the School Committee, and two members of the Select Board passed overwhelmingly. GRANT said that the Town Meeting result shows that the Select Board is out of step with the voters and that change is needed. GRANT, who works as a federal prosecutor, also coaches youth soccer, basketball, and track in Longmeadow. GRANT is a graduate of Stanford University and Cornell Law School. GRANT reminded residents that the passage of the compromise budget was a limited victory that merely mitigated the cuts to services contemplated by the Select Board budget. The budget passed was still closer to the 0% Select Board approach than to maintaining level services. GRANT does not want to see the quality of life in Longmeadow diminished. Voters will have a chance to visit GRANT’s booth and meet the candidate in person at Longmeaddowe Days on May 18 and 19. Longmeadow’s Town meeting was held last week – and the proceedings of that meeting are reported elsewhere in this newspaper. From the front of the room, the vista was amazingly positive; hundreds of town residents had come out of their homes on a beautiful spring evening to perform the duties of the legislative branch of town government. At the meeting, as part of the continued discussion on renewing the infrastructure of the town, citizens approved over $5,000,000 in funding for capital expenditures, authorizing the use of funds from the operating budget, stabilization funds, and the issuance of bonds to begin work on the backlog of over $140 million in capital projects that have been identified for our roads, sidewalks, storm water outfalls, drinking water, and sewage systems. $2,200,000 of these expended funds is derived from water and sewer fees or designated state aid, but $2.8 million is primarily paid through property taxes. If we are to continue to maintain the town’s infrastructure, as we must, and continue to support the operations of the town’s general government services and schools as we want, we must find a way to fund capital improvements that provides the necessary millions of dollars in needed financing while continuing to provide funds for general government and school operations. I believe that this balanced approach to funding both capital and operating expenses can be met. Beginning when I was chair, the capital planning committee has recommended each year that that capital funds be increased above their current level of 2% of property tax revenue. For the past two years, the Finance Committee has echoed that request. 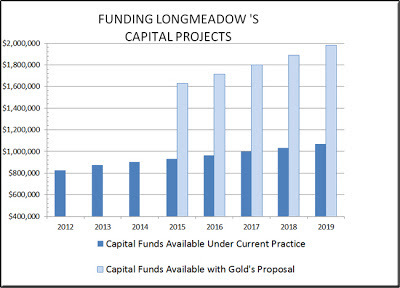 By ramping up Longmeadow’s commitment to capital from 2% to 2.5% over five years, and dedicating those increases to capital improvement bonds, Longmeadow can make available approximately $4.5 million of additionally needed funds to address the most pressing of our capital needs (see chart below). This gradual increase in the capital allocation would require only $50,000 of each year’s allowable increase under the Proposition 2 ½ levy limit, leaving over $1.1 million in increased revenue to support the growth of the overall town budget and, equally as important, not impact the funds available to purchase plows, equipment and other non- infrastructure capital needs. Our infrastructure was built over many decades and this balanced approach provides the added funds to begin to address these needs without having to make unacceptable cuts to the town’s operating budget. This proposed approach to funding our infrastructure needs mirrors the structure adopted by the Town for funding new fire trucks. Prior to the creation of our fire truck replacement fund, the purchase of a fire truck was a major expenditure that required offsetting cuts elsewhere in either the operating budget (to pay for a bond) or the capital budget (precluding the purchase of other capital items). In place since I recommended it during my tenure as chair of the capital planning committee, an annual payment into the fire truck fund has been integrated into Longmeadow’s capital plan, and has provided funds to pay for two new fire vehicles with minimal impact on either operating budgets or other capital expenditures. Longmeadow’s capital infrastructure needs must be addressed. 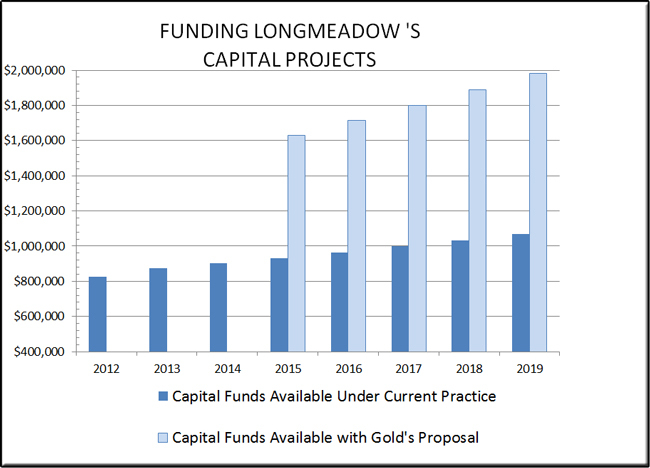 By gradually increasing, and allocating that increased portion of our capital budget to infrastructure repairs, the Town of Longmeadow can adopt a balanced approach to funding the capital AND operating needs of the town. This proposal is but one of the ways in which I hope to continue to bring to the voters of Longmeadow a balanced approach to town government. For more information about how we can address the financial needs of the town, visit my website www.GoldForSelectboard.com. At the May 7 Town Meeting, there was a warrant article that should have been on the docket, that should have been voted on, and that deserved passage. It was an article that had been part of an earlier draft of the warrant, and then it was removed through an improvident 3-2 vote by the Select Board. It was an article that could have made a difference to hundreds of youth and adults. The article was the Community Preservation Committee's (CPC) proposal to repair and improve the Wolf Swamp fields. The absence of the Wolf Swamp fields project on the Town Meeting warrant was a missed opportunity that reflects a lack of regard for the work done by the CPC and the Parks Board, which had carefully considered the proposal. Its absence on the warrant also reflects, shall we say, an overabundance of confidence that the three Select Board members held in their own judgment and wisdom. That confidence propelled the Select Board majority to substitute its opinion for the assessments of a greater number of folks who had spent more time studying the subject. The Wolf Swamp fields badly need repair, and their use needs to be re-oriented to sports like Lacrosse and Soccer, where interest is intense, and so part of the proposal was to fill in two ball diamonds in favor of more field space. To accomplish this, the project required $96,000, and the money was to have been derived from Community Preservation Act (CPA) funds, which allows the town to receive a 26% match from the state, which is about the best deal in municipal finance. So how can a project with unquestioned merit and which makes fiscal sense go down to defeat? Or more precisely, how can such a project be kept from the voters at Town Meeting? The CPC voted unanimously, 9-0, to approve this project. Other CPA projects were rejected, tabled, or failed to pass so overwhelmingly. The CPC included people with histories of long service to the town, such as Gerald Nolet, Arlene Miller, and James Goodhines. This group was not apt to venture out on poorly designed schemes. It was certainly a group that would not agree on every town issue, but it could agree on this. The Select Board has many other things to do besides second-guessing the layout of sports fields and the angles at which lacrosse balls may be flung. The objections raised by the members who voted to kill the warrant article showed no deference to the review done by the many people who have given a lot of thought on how best to use the town's resources for recreation and sport. One Select Board member suggested that still more review should be done by the Planning Board and by the Town safety committee. After input by the Parks Board, a vote by nine members of the CPC, review by the Select Board, and a vote by residents at Town Meeting, this process hardly cried out for more bureaucracy. As Mr. Goodhines noted, the need had been identified for several years, and the project was advanced after receiving feedback from the community. The shame in all of this is that the voters were denied a chance to have their voices heard. Was this idea so dangerous that the people could not be trusted to vote on it? While it was within the power of the Select Board to eliminate this article, surely that power must be tempered by a decent respect for the opinions of the constituents who conferred that power by electing the members of the Select Board. Was it not possible that the voters, had they approved the article, were right, and the three members of the Select Board wrong? At worst, the Wolf Swamp fields project was a matter on which reasonable minds could differ. Then why not allow our direct democracy to work? Why not allow the clash of ideas, the questions and answers, and the discussion on the floor of Town Meeting to illuminate the best path forward? Justice Oliver Wendell Holmes, Jr. once said that "the best test of truth is the power of the thought to get itself accepted in the competition of the market." That competition was overridden in this instance, but in our system, the debate never ceases, and this question will arise again, and the expression of the views of the electorate cannot be silenced forever.